On June 23rd 2016, I was shocked when the UK voted to leave the EU. It all became very real when Theresa May launched the formal two year process, the official Brexit countdown to March 29th, 2017. RTÉ recently quoted a PwC report on Brexit stating that “The UK’s current unwillingness to consider a Customs Union, and continuing talk of ‘cherry-picking’ which arrangements it does or does not want to retain means that a hard Brexit remains too likely for businesses to ignore,” Feargal O’Rourke, PwC’s Ireland Managing Partner. Feargal O’Rourke went on to say “the only thing we can be sure of is that disruption and change is inevitable – firms need to prepare now for additional costs, border issues, disruption to supply chains and people mobility issues”. You can view the full RTÉ article here. I was privileged to be invited to the christening of CLDN’s MV Céline in Dublin Port. Standing on the freshly-painted deck of the MV Céline got me thinking about the challenges Ireland will face maintaining easy access to Europe. So I decided to take a closer look at the challenges that ferry companies face in light of this huge change and the provisions they are putting in place. It is yet to be seen how this particular scenario will pan out but Verona Murphy of the Irish Haulier’s Association told the Irish Times that “any deviation in legal requirements by either side could be extremely problematic for drivers and owners”. Another issue that is being considered is the time delay that will occur if deliveries have to go through customs in the UK. This will not only affect delivery times but will also have a big impact on costs. Even more critical is the impact on fresh food that needs to be transported swiftly. Chairman of Cork Port, John Mullins said that “there isn’t enough time for food exports to wait in the UK if border restrictions are imposed”. I’m a glass half-full person, so with challenges there are usually opportunities. We are also seeing the launch of new fleet. Irish Ferries are about to launch the WB Yeats which is the largest vessel on our seas and will commence this summer transporting travellers from Ireland directly to France. As mentioned above, I was delighted to be invited to the christening ceremony of the MV Céline. 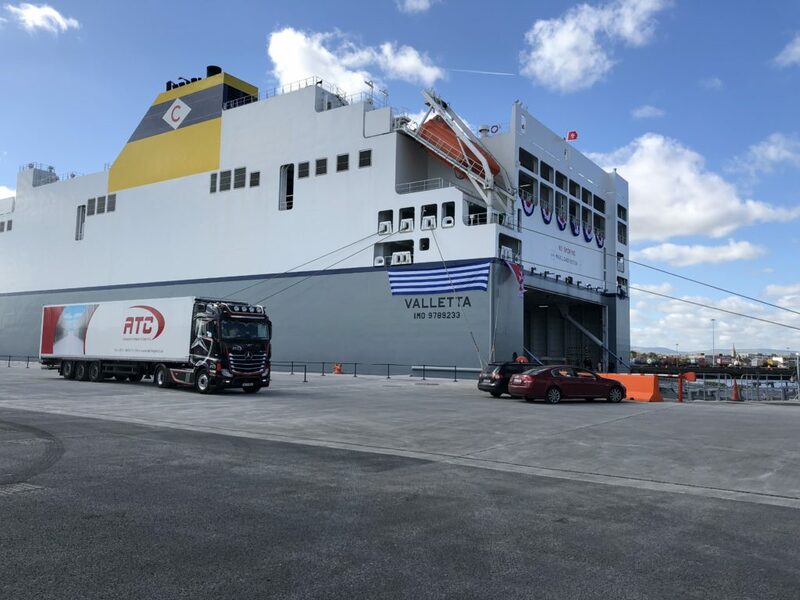 This is the world’s largest ro-ro ferry which will travel from Ireland to Belgium and has been described as a “game changer”. At 234m, the MV Celine has a capacity of 8,000 lane metres! To read more about the MV Céline, click here. While there are still many decisions to be made by ferry companies and Irish Ports about the future operations post-Brexit, there is no doubt that there will be a “change of course” in the transport and logistics industry as a result.